The main attraction at the O'Fallon Historical Museum at Baker, Montana is Steer Montana. Steer Montana is a Roan Polled Shorthorn Breed that was born March 23, 1923. He lived 15 years and 4 months. A local rancher, Mr. Jack Guth raised and used Steer Montana in traveling shows. He has been shown in over 60 different state fairs, stock shows and carnivals such as Minnesota, Wisconsin, Arizona Los Angeles, Fort Worth and many others. He has also been displayed at the dairy Cattle Congress at Waterloo, Iowa. Steer Montana grew to be the largest bovine animal in the world, and that record still stands today. Steer Montana statistics are 5 feet 11 inches in height, 10 feet 4 inches in length, 9 feet 2 inches in girth and certified weight of 3,980 pounds. Early day ranches tell the tale that Steer Montana grew into such a large animal because he was fed grain mash (a left over product from the local bootleg liquor trade.) Today we might say it was in his genes. Steer Montana had two brothers, Brother Spot weighing 3,230 pounds and Brother Bulgy, weighing 3,580 pounds. Whereas they were both huge animals, not quite as large as Steer Montana. 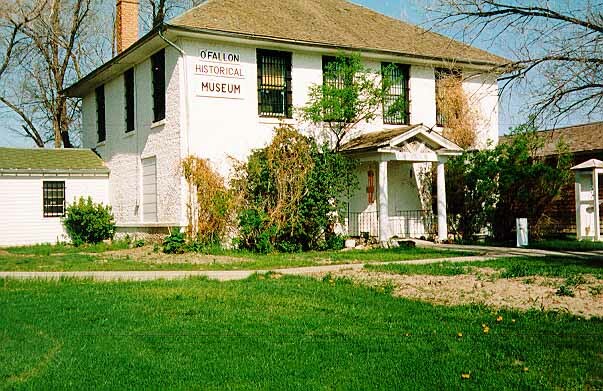 The O'Fallon Historical Museum is located at 723 South Main. Drive one block west from the street light and turn south down First Street West, go south 6 blocks, turn east and go to the end of the block and turn south. We are behind the City and County building. Another way is at the street light turn south and go down Lake Street on Highway 7, seven blocks until you get to Lincoln Avenue and turn west, one block. The museum is on the corner at the end of the block.The O'Fallon Historical Museum is located at 723 South Main. Drive one block west from the street light and turn south down First Street West, go south 6 blocks, turn east and go to the end of the block and turn south. We are behind the City and County building. Another way is at the street light turn south and go down Lake Street on Highway 7, seven blocks until you get to Lincoln Avenue and turn west, one block. The museum is on the corner at the end of the block.